Wow what a meet! 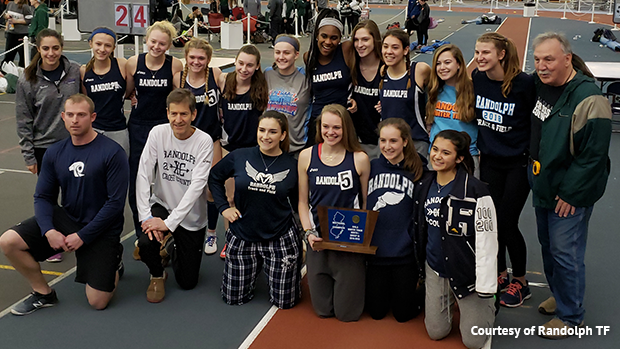 We had two girls teams score 70+ points in powerhouse showdown between the winning Randolph girls, 72 points, and second place Northern Highlands, 70 points. The boys side had its own fireworks when an already closely competed team score was thrown adrift after a lap counting error in the 3200m at the end of the meet. 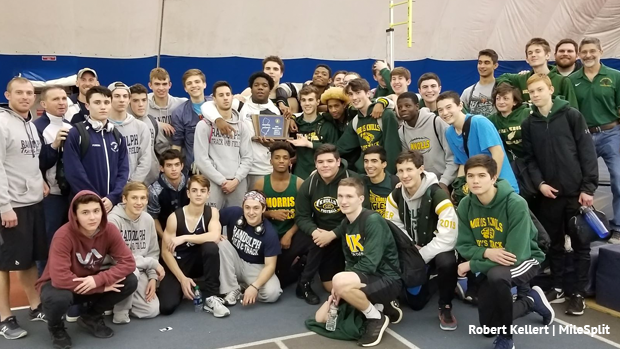 Randolph and Morris Knolls ended up sharing the North 1 Group 3 title. This is the Randolph girls fifth overall title, the boys second, and the Morris Knolls boys took home their first Sectional. The Boys Championship Run Down.. After the dust settled and the running order of the boys 3200m was finalized, the race had erroneously been instructed to run one more lap so they reviewed the times from the true distance of the race, it was declared a tie between Morris Knolls and Randolph for the boys North 1 Group 4 title at 46 points a piece. Let's run through the meet to highlight this boys team points showdown. The 400m opened up with a Morris Knolls lead thanks to a second place finish from Brendan Kovar at 51.82. Randolph fired back with James Keaney and Joseph Hecht second and fourth in the 1600m at 4:35.76 and 4:39.43. The 55m hurdles saw both teams strike but the win went to Nick Boss of Knolls at 7.81, Randolph's George Houston and Jacob Hitland fourth and sixth. The battle raged on in the field where Eric Byrne of Randolph won the pole vault at 13-03, teammates Nick Adams and Jason Tomaino fourth and fifth at 12-06 and 12-0. Knolls saw Robert Plumb clear 13-0 for third in that event. The high jump gave Randolph the advantage again with Hutland clearing 6-0 for second, Knolls had Matt Adetula fourth at 5-08. And then in the shot put the one point between the teams went to Chase McBride of Randolph in sixth at 44-06. Back to the track and Morris Knolls scored fifth in the 800m off of Noah Schagelin's 2:03.82. That was followed by a win in the 55m dash from Raul Esteves at 6.73. The 4x400m was completed before the 3200m results with Knolls third at 3:34.55 and Randolph 5th 3:35.74. At this point everyone is waiting for the 3200m results to be announced, Morris Knolls has a two point lead. They finalize and Randolph earned fifth to tie the meet thanks to James Keaney running 10:11, he had earned second in the 1600m earlier. They held a coin toss for the trophy and this great moment occurred. Onto the Randolph girls championship where they found gold three times, two of them compliments of Abby Loveys. Loveys won the 1600m and 3200m with times of 4:58.56 and 10:34.25, that 3200m moves her up to US#3 this season and is the overall Sectional meet record! Knocking off the 10:39.19 posted by Mackenzie Barry of Mendham in 2012. Her teammates also added up the points in those races with Meredith Finley placing second in the 1600m at 5:07.33 and Maya Wilkins fourth in the 3200m at 11:57.20. Finley also earned fourth in the 800m running 2:22.59. Randolph's other win came during the high jump where teammates Meghan O'Malley and Karen Hull both cleared 5-04. O'Malley getting the victory on jumps and Hull placing second. Hull and O'Malley weren't done there though, they also ran second and third in the 55m hurdles where Hull posted 8.48 and O'Malley 8.70. Then Hull returned for fourth in the 55m dash at 7.57, all season bests for her. Their 4x400m sealed it with their fourth place finish to stay ahead of Northern Highlands who charged ahead for a second place finish at 4:11.88. Northern Highlands had a big meet from Grace Smiechowski who won the 400m at 59.71, was fourth in the hurdles and sixth in the 55m dash. They also saw a win from their thrower Brynn Madonna at 33-03.25. Kyla Krawczyk won the 800m running 2:21.61 and was second in the 400m dash. Erika Kluge vaulted 9-06 for second, Daisy Liljegren second in the 3200m at 11:03, and Jessica Reilly placed sixth in the 3200m. Other highlights from this meet... Grace O'Shea of Ramapo won the 55m hurdles with an 8.38 and was second in the 55m dash to Kayce Darby of Teaneck who won the final with a 7.25. Ramapo's Sarah Adams took home the 800m medal with a time of 2:19.73 and they also won the 4x400m with a 4:05.68. Old Tappan's Marisa DiGia cleared 11-06 to win the pole vault.